When the Black As boys, Jerome, Chico, Joe and Dino, sat down with director David Batty to plan their web series, it had been raining hard in Ramingining for weeks on end. Some were calling it the biggest wet season in living memory. Hemmed in by the torrential downpour, the East Arnhem Land community was growing tired of store provisions and eager to savour some fresh bush tucker. When the wet finally broke, the cast and crew were spurred into action. 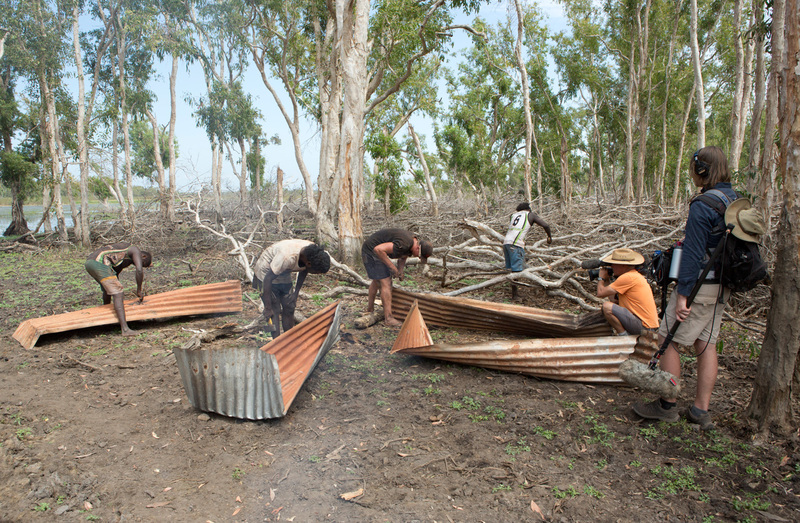 The late arrival of the dry season was a reminder of how deeply the weather dictates life in the remote Top End. When David returned the following year to shoot the series, the Wet had left an even bigger mark. Cyclone Lam had ripped through the country the boys had explored while putting together the pilot episodes and it was no longer accessible. With their regular tracks blocked by fallen trees, the community had to hack out new trails. The cast embarked on new adventures, rescuing abandoned vehicles, adding greater challenges to the task of gathering bush tucker. The sparkling swamplands by the Arafura Sea were teeming with wildlife – roos, geese, crocs, seafood, shellfish and mangrove worms all end up on the menu. The country provides plenty of feasting and a spectacular backdrop for the adventures the team had sketched out. Equipment failure is another recurring theme. Breakdowns are frequent from the stress of constant bush bashing in clapped-out rustbuckets that had never been serviced by a mechanic. With no access to reliable spare parts, the boys must constantly fall back on their creativity and resourcefulness. There’s a solution to every problem and the fearless foursome always find it – or carve it out of a tree. Alongside this ingenuity is their detailed knowledge of their country, its risks as well as its rewards. There’s another facet David observed to this deep connection the boys share with their country and all its creatures – the need to meet the deadlines imposed by the natural cycles of the bush. None of the drama captured on film was set up. The team planned a series of scenarios and then went about making them happen. The action unfurled in its own unscripted way, as it tends to do in remote communities where opportunities must be grasped before they pass. This spontaneity is evident when the boys are on the hunt. One time as the cast was crossing a large open plain they spotted a water buffalo in the distance. Instinctively they crouched down. This willingness to take their chances, whatever the odds, makes for captivating viewing. The search for bush tucker drives the action and the rugged country provides a grand setting, but it’s the energy, ingenuity and irrepressible enthusiasm of these four young men that makes this web series a rollicking adventure from start to finish.